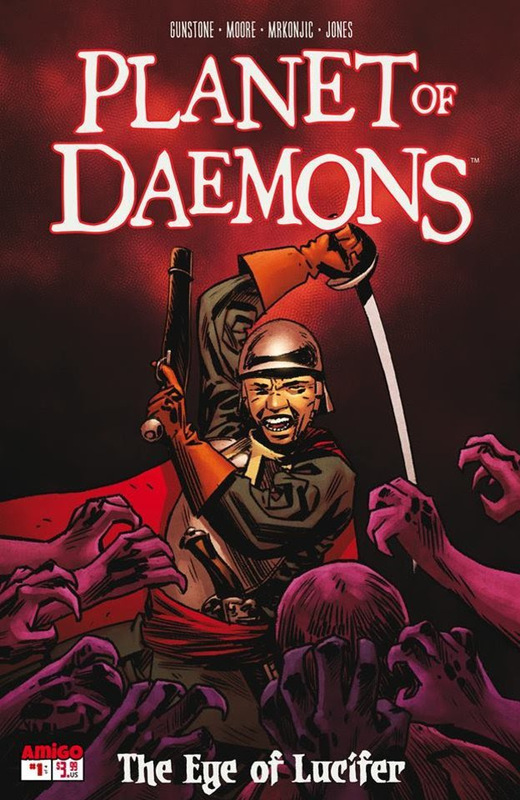 Amigo Comics are proud to announce the September 2016 launch of PLANET OF DAEMONS, a bewitching miniseries of occult adventure created by the British creative team of Kevin Gunstone and Paul Moore. Set in the arcane realm of the Qliphoth and 17th century New England, PLANET OF DAEMONS follows the fortunes of Amos Deathridge, a former Puritan magistrate who now serves as jailer of the daemons and evil spirits who cast their sinister influence over mankind. PLANET OF DAEMONS’ writer Kevin Gunstone - who’s most recent work was the award-nominated FUTURE PRIMITIVE for Markosia - commented: “Amigo have published some great books in the last few years, so when El Torres (Amigo publisher) asked me if I’d be interested in creating a series for them I couldn’t have been more excited - and this is the result! PLANET OF DAEMONS marks the first occasion Amigo have published British talent. “We amigos are immensely proud of having Kevin and Paul as part of our little team. And PLANET OF DAEMONS will be a milestone in Amigo Comics”, said El Torres. Planet of Daemons is a spectacular four-issue miniseries of mystery, intrigue, and dark sorcery. Written by Kevin Gunstone (FUTURE PRIMITIVE and DIS), art by Paul Moore (ZARJAZ), colored by Stefan Mrkonjic (FUTURE PRIMITIVE) and lettering by Rob Jones (MADIUS COMICS). The first issue ships in September 2016 and is solicited in the July edition of Previews.